NOTE: If you came here looking for a sermon by Stef Liston, you can find it here. This is part of the story of David and Bathsheba. David has committed adultery, then had Bathsheba’s husband killed. Bathsheba has given birth to David’s son, David has been confronted by the prophet Nathan, he has repented, and God has forgiven him, but has told him his child will die. David has been fasting and praying for a week, asking God to relent and spare his son, yet his request has not been granted. 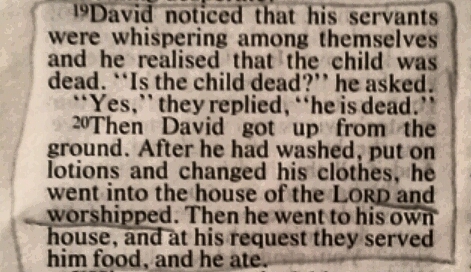 David’s response is remarkable: he worships God. It’s so easy to worship when God has answered our prayers in the way we want, isn’t it? (Though it’s also all-too-easy to forget to.) Worshipping him when our requests are denied, when our hopes and dreams are dashed and when our deep desires are thwarted, is much harder. It’s counter-intuitive, counter-cultural, but completely consistent with the faith we profess. God is always good, wise, loving and righteous. All he does is good, and he is always worthy of praise, no matter how we feel about it.